Many developing countries recognize that agroforestry offers benefits for both people and planet and have integrated it into national policy to help meet development and climate goals. Despite this interest, technical and institutional barriers often prevent trees outside forests and agroforestry from being recognized in United Nations Framework Convention on Climate Change (UNFCCC) measurement, reporting and verification (MRV) processes, such as national greenhouse gas inventories and REDD+. This lack of inclusion means agroforestry is less likely to receive financial investments and other support to match its potential significance in addressing climate change. Some countries have found ways to overcome these barriers, providing lessons for others to follow. Successful arrangements include: development of policy and regulations directly addressing agroforestry; farmer and producer groups are involved in the process; there is a collaborative research environment; and coordination among the diverse institutions involved with land use. Rosenstock T, Wilkes A, Jallo C, Namoi N, Bulusu M, Suber M, Gurwick N. 2018. 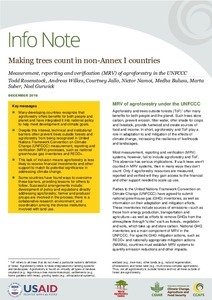 Making trees count in non-Annex I countries: Measurement, reporting and verification (MRV) of agroforestry in the UNFCCC. CCAFS Info Note. Wageningen, The Netherlands: CGIAR Research Program on Climate Change, Agriculture and Food Security (CCAFS).